The recently signed Joint Comprehensive Plan of Action (JCPOA) between Iran, the United States, the United Kingdom, France, Germany, and China was barely completed and announced to the world when debates about its impact began. As can be expected, much of the conversation since the announcement has been focused on Iran’s nuclear program and whether this plan can prevent it from acquiring a nuclear weapon in the future. Formally speaking, the JCPOA leaves Iran enough capacity to still attain a nuclear weapon in the future should it decide to pull out of the agreement. But the question that must be asked, that we must keep in mind when discussing JCPOA, is this: What does Iran gain by signing the JCPOA? When one considers that Iran has expended a great deal of resources over previous decades on building up its nuclear program, there has to be a serious reason for it to give up its nuclear aspirations now. Iran has spent billions of dollars on building infrastructure: nuclear reactors, centrifuges, and facilities; attaining nuclear materials; and thousands of man-hours expended on uranium enrichment. So why after all that material, time, and man-power investment does Iran reverse course and agree to curb its nuclear aspirations? The most obvious gain to the Iranian government and its partners in the JCPOA is the economic and geopolitical cascade effects of full Iranian reintegration into the global economy. Iran’s economy has taken hits related to drops in the price of crude oil the last couple of years from over $100.00 a barrel to just above $50.00, as well as chronic strains on economic output because of sanctions imposed by the UN, the EU and the US. Prior to the imposition of sanctions, Iran was OPEC’s second largest oil producer with the fourth largest oil reserves and second largest natural gas reserves. Indeed, 80% of Iran’s economy was based on its petroleum industry. Iran’s economy was growing before the sanctions and it enjoyed a relatively low unemployment rate. As intended, these sanctions have had a devastating effect on the Iranian people over the last decade since their imposition. Iran’s unemployment rates now hover in the low teens and 20% of its population lives below the poverty line. Iran would greatly benefit by a return to its pre-sanction economic output. For the European Union, Iran’s return to the global market would offer it a welcome alternative to obtaining its natural gas supplies from someone other than Russia. Russia has used threats to shut off natural gas supplies to Europe to gain leverage in negotiations on the situation in the Ukraine. While much of Western Europe isn’t 100% dependent on Russia for its natural gas supplies, it nevertheless must be very attractive to remove that threat leverage from future negotiations with Russia. So on this level the JCPOA has very little to do with joining or being prevented from joining the global nuclear club and much more about a return to what must be seen in Iran as its proper economic birthright on the global market and in the EU as a wonderful chip to work against the Russian Federation as concerns its own energy needs. But as we continue to ponder the question of what Iran gains by signing the JCPOA, we must begin to look also at a less obvious and, at least in our opinion, more compelling reason for its sudden agreement to capitulate on a nuclear program now. It is Iran’s demographics and the potential for political unrest related to its large youth population that can no longer be simply dismissed by the governing authority. Since the Ayatollah’s revolution Iran’s population has doubled and nearly 50% of the population is now under 35 years old. Unlike previous generations, this youth population is well-educated, since earning a college degree was highly encouraged by the Iranian government since the revolution. Despite their education levels, the brute force and displacement of the economic fall-out caused by sanctions has fallen squarely on this young and talented generation. Youth unemployment remains at nearly 25%, double the rate of other generations. The last time Iran had youth unemployment rates this high was in the decade prior to the revolution. The current regime is largely dominated by leaders who were youth members of that revolution. We find it hard to believe they themselves fail to recognize the strange similarities between the current situation and the 1970s, especially if they continue to ignore youth dissatisfaction. The Iranian Islamic Revolution was largely born within a restive youth population suffering from high unemployment rates that then partnered with other marginalized groups to overthrow the Shah and his US-backed government, which almost all sides had come to view as corrupt and ineffectual. While the current youth dissatisfaction has no religious underpinning or charismatic single leader to powerfully unite them all, it is not illogical to think current progressive thinkers within Iranian authority see concern with all this displaced anger and wasted young talent. For recognizing that danger and trying to counteract it through the JCPOA, Iran has proven itself to be diplomatically cunning and adept. Keep in mind Iran had already experienced civil unrest from this demographic group. Following the 2009 presidential elections the Green Movement, which supported reform politicians in the elections, organized and led some of the largest protests seen in Iran since the revolution itself. Hundreds of thousands of Iran’s youth were in the streets protesting for political reform in the weeks following President Mahmoud Ahmedinejad’s reelection. While the government ultimately quelled the protestors, the sentiments expressed by the movement did not just melt away. On the contrary, the Green Movement has always been working below the surface of Iran’s political scene, pushing for democratic and social reform. 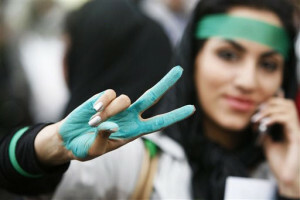 As the 2011 Arab Spring spread through neighboring nations, Iran’s leaders had to notice the similarities to the Green Movement protests of 2009. They might have even worried that the base source for the Arab Spring may have been its own quashed Green Revolution. There had to be concern that the Arab Spring could create a ‘full circle’ effect, bringing revolution back to the place it all almost started three years before. In addition, the countries that had the largest protests and ultimately largest reforms were the countries that had similar demographics to Iran: high youth populations and high youth unemployment rates. During the Arab spring, leaders of the Green Movement organized street demonstrations that had nearly a million protesters on the streets of Tehran. The candidates selected by the Guardian Council in the 2013 election cycle also show that while the Green Movement is not as openly active they are still clearly on the minds of the ruling class: the eventual winner, while a conservative leader, has shown more willingness to enact reforms and engage the broader population across the country. The ultimate goal for Iran to join the JCPOA is rebuilding economic opportunities for its large youth population and hopefully redirecting it energies into building careers, raising families, and achieving stability and prosperity. Prior to the JCPOA, with sanctions still firmly in place, those goals had to seem largely out of reach for many of the young members of Iran’s society. Again, the true diplomatic talent with the nuclear accord is in Iran recognizing what could be a boiling point for political dissent and with one deft stroke has attempted to turn that energy into an economic aspiration for the entire country. Once it gains economic prosperity for its youth population, while still trying to ensure political stability for its ruling class no doubt, it will be interesting to see if Iran will continue to follow the mandates set out for it under the agreement. Or will it choose to pull out of the agreement (as it has a right to do let’s not forget) and return to its quest for a nuclear weapon, only now with the stability and prosperity and LEVERAGE of being a fully integrated and quite possibly valuable piece of the global energy economic puzzle for the Western world. Who says global affairs isn’t full of irony in the modern day? The Iran accord proves this cynicism false. Dr. Matthew Crosston is Professor of Political Science and Director of the International Security and Intelligence Studies program at Bellevue University, and Paula Malott is a 2012 graduate with a Bachelor of Science degree from Bellevue University’s International Security and Intelligence Studies program. She is currently employed as a Department of Defense contractor (Booz Allen) instructing Intelligence Analysts for the U.S. Air Force, exclusively for the online magazine “New Eastern Outlook”.